Read our guide then gather your party. Baldur's Gate: Enhanced Edition is finally available to download from the App Store, and we had much praise for the game in our review earlier today. 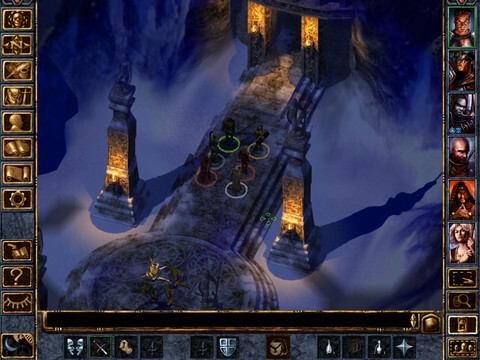 If you're completely new to the world of Baldur's Gate, there's a huge amount to get to grips with, so we've put together all of our top hints and tips for newcomers. What's the best way to learn the basics in Baldur's Gate: Enhanced Edition? There are two different ways of getting to grips with the core concepts of the game. You could go through the tutorial that's accessed through the main menu page, but to be honest we found the in-game tutorial much better at teaching you the ropes. Take your time in Candlekeep and talk to everyone, particularly the monks in green robes. Other people may give you small challenges to get your knowledge up to speed. What's the best character to use in Baldur's Gate: Enhanced Edition? As you'll be playing in a group for the vast majority of the time, focus on the class archetype that you prefer playing, be that the up-close Fighter, the mystical ranged Mage, or the singing Bard. You can even create an entirely new character, although this isn't recommended for true beginners to the game. How do I upgrade my equipment in Baldur's Gate: Enhanced Edition? If you've found yourself in possession of a shiny new piece of armor or weaponry, hit the backpack icon to equip it to a character. 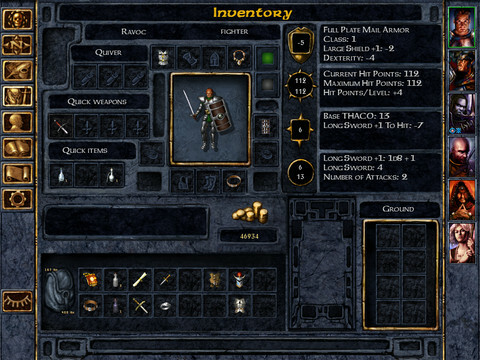 Once you're in this inventory, you can cycle between characters using the portraits on the right-hand side of the screen. To equip a new item, simply drag it from the backpack and onto the character you wish to equip it on. Try and keep your team evenly upgraded so that no-one falls behind and becomes vulnerable. How does combat work in Baldur's Gate: Enhanced Edition? 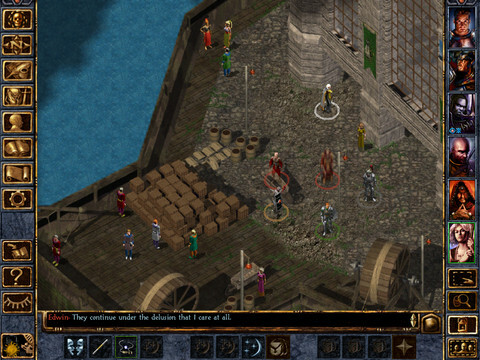 The party system in Baldur's Gate: Enhanced Edition means that you'll have to take care of a large number of fighters at once. In order to do this, make extensive use of the pause button in the bottom left-hand corner of the screen. This will allow you to tweak your team's combat on a moment-by-moment basis, and as the fight evolves. It's well worth spending a great deal of time exploring the different attributes of each character, as you want to make sure you're getting the most out of their skills, as well as placing them correctly on the battlefield. How does the quest journal work in Baldur's Gate: Enhanced Edition? Hit the quill icon on the left-hand side of the screen to access the quest journal. From here you can view the quests you've completed, as well as the objectives you need to finish in order to complete a current quest. The true role-players can even create their own quest notes and stories in this section. How do I create a multiplayer game in Baldur's Gate: Enhanced Edition? To join a multiplayer game in Baldur's Gate: Enhanced Edition, you're going to have to configure the connection manually until Beamdog provide a more user-friendly connection system in a future update. Head into the Multiplayer section from the main menu to configure your setup. What does the Party AI function do in Baldur's Gate: Enhanced Edition? This will take some of the challenge of managing your party away from you, and your characters will show a measure of intelligence in battle. You'll eventually want to turn this function off via the interface, but make sure you really understand the combat systems before doing this. The results will be messy otherwise! How does the formation system work in Baldur's Gate: Enhanced Edition? If you've been playing around with the interface, you'll have noticed a series of icons featuring collections of dots. These are the different formations you can have your party assume. Bear in mind when playing with formations that you'll typically want your vulnerable ranged characters placed behind the melee fighting force. The best way to get acquainted with your party members is to explore their attributes. Hit the statue head icon in the middle of the left-hand interface to open up the character screen. From here you can tap the different party members on the right of the screen to cycle through them, read biographies, view stats, and even customize them. How do I select more than one party member in Baldur's Gate: Enhanced Edition? At the bottom right-hand corner of the interface you can find a rectangle icon. Tap on that once to toggle it on, then draw a rectangle around the characters you want to group together with a single finger. Tap the rectangle icon again to toggle this function off. How does the save system work in Baldur's Gate: Enhanced Edition? Make extensive use of the quick-save icon on the left of the screen. It's a good idea to save your game before making key decisions so that you can always return to an earlier state if it all goes horribly wrong. What is The Black Pits content in Baldur's Gate: Enhanced Edition? The Black Pits is a new area of content for the game that's entirely separate from the main campaign. You can access this content from the main screen that appears after the introduction cinematic. 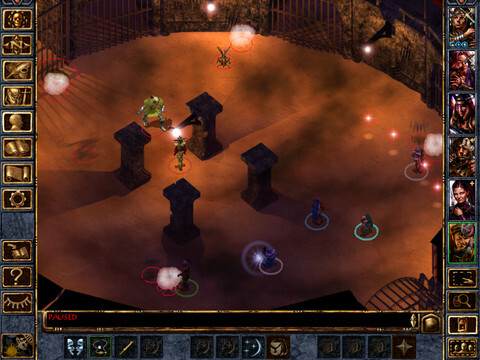 This is an arena mode where you and your party will face off against a series of increasingly challenging opponents. Make sure you're at least acquainted with the basics of combat before entering this section of the game, or you'll be in for a grim surprise! How can I get new equipment in The Black Pits? Devlin can provide you with an assortment of shortbows, longbows, crossbows and other ranged weapons, as well as all of the ammunition you'll need. The fiery Magda specializes in the sort of spears, axes and mighty hammers that your melee party members will need in the heat of battle. Need a dagger or a sword? Pay a visit to Thardek for the latest in sharp-edged slicing equipment. Dinguer has all of the arcane scrolls and buffs that you're going to need to both keep your arena opponents at bay, and keep your party alive. For all of your potion needs, talk to Bellowgulp near the arena entrance. He'll be able to sell you the healing and defensive potions necessary to make deeper progress in The Black Pits. Gotch has the kind of heavy armor that your up-close-and-personal melee party members are going to need if they're to stay alive in battle for long. If you need to kit out your more magical characters, talk to Brendak who has a decent range of light armor.